Toradex has announced the release of the Colibri Evaluation Board (V3.1A) – a flexible development environment for evaluating the functionality and performance of the entire Colibri computer on module product family. The board includes support for the enhanced functionality on the Colibri T20 and Colibri T30 modules which feature the NVIDIA® Tegra™ 2 and Tegra 3 processors. 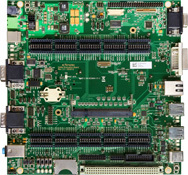 All interfaces of Colibri Computer on Modules are designed to be easily accessible by external hardware. The required hardware and standard connectors for most common interfaces are already integrated. On-Board DC/DC converters deliver up to 5 Amps at 5V and 3.3V for additional hardware. For technical details including schematic and Altium Designer project, visit our Developer Website. You can also find more information on the product page.